It doesn’t get much simpler than some tasty local honey in a mini jar with a cute “love is sweet” tag. Honey alone is a well-liked classic and, given the fact that edible honey has been found in the pyramids, it’s definitely something you can put together ahead of time. 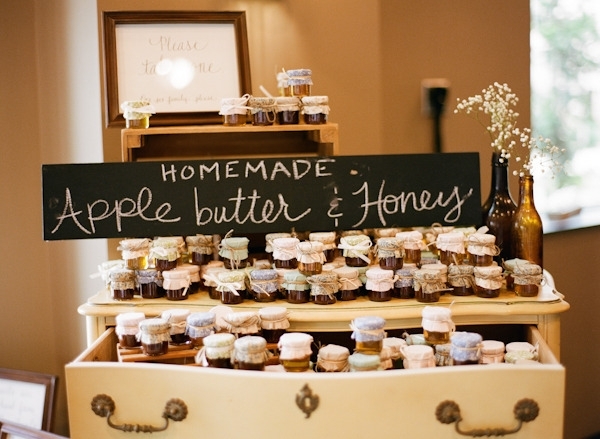 If you’re feeling fancy, you can send guests home with delicious biscuits to go with the honey. Cookies are a pretty universally-loved treat. To make things really easy for yourself, place an order from your favorite bakery with the intention of picking them up 1-2 days before the wedding. Then set them out at the wedding with bags (bonus points if you have brown paper bags printed with a “thank you” message!) and invite guests to help themselves. Local coffee beans are a great choice for a destination wedding. Your guests will thank you when they get home and brew it…or when they have something besides hotel room instant coffee to take the edge of their champagne-induced hangovers the morning after your wedding. And if coffee isn’t your cup of tea, then, well, you can easily substitute tea instead. Candy makes for a fun favor because it’s an indulgence that most adults don’t enjoy very often. You can go for a chic, upscale candy, get a foodie-friendly candy like beer-and-pretzel caramels or do a beloved childhood candy. While you may want to skip this if you’re inviting children to your wedding (or just clearly label which favors are for grown-ups! ), it’s a fun choice if your guests are the type who love to raise a glass. Mini bottles of champagne or a local liquor are a fun and memorable gift to send them home with.